There are thousands of different proteins across several different classes in biology, each with a distinct purpose. In your research environment you need tools that help you identify and classify your proteins with confidence. GoldBio’s BLUEstainTM , PINKstainTM and True BlueTM ready-to-use protein ladders offer high band resolution across a wide range of molecular weights, and our electrophoresis gels and dyes like ponceau S help you separate and visualize your protein sample. GoldBio’s commitment to quality and affordability assures you the best products for the best price. The BLUEstain™ 2 Protein ladder is a three-color protein standard with 13 prestained proteins, covering a wide range molecular weights from 3.5 to 245 kDa. Proteins are covalently coupled with a blue chromophore except for two reference bands (one green and one red band at 25 kDa and 75 kDa respectively) when separated on SDS-PAGE (Tris-glycine buffer). 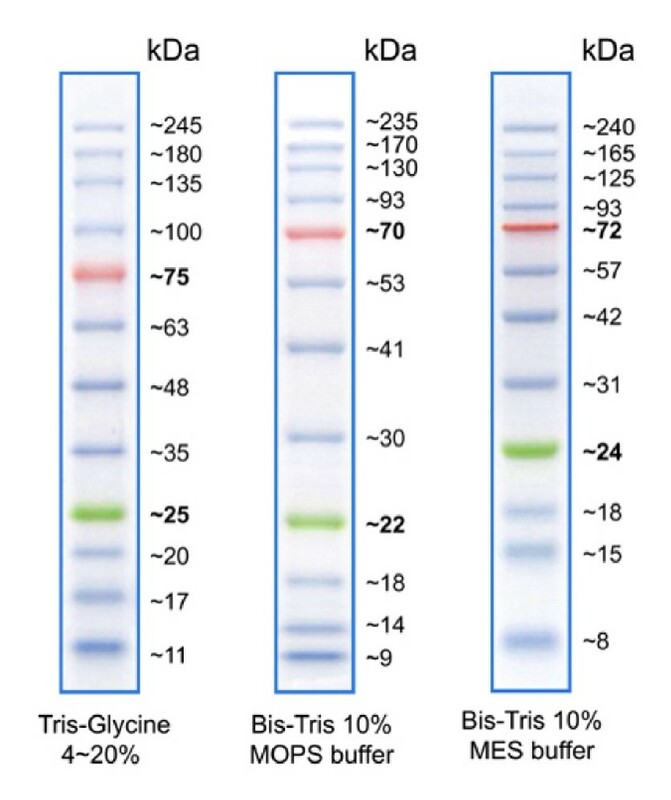 The BLUEstain™ 2 Protein ladder is designed for monitoring protein separation during SDS-polyacrylamide gel electrophoresis, verification of Western transfer efficiency on membranes (PVDF, nylon, or nitrocellulose) and for approximating the size of proteins. The ladder is supplied in gel loading buffer and is ready to use. Do not heat, dilute or add reducing agent before loading. Store at 4°C for 3 months. Store at -20°C for 24 months. 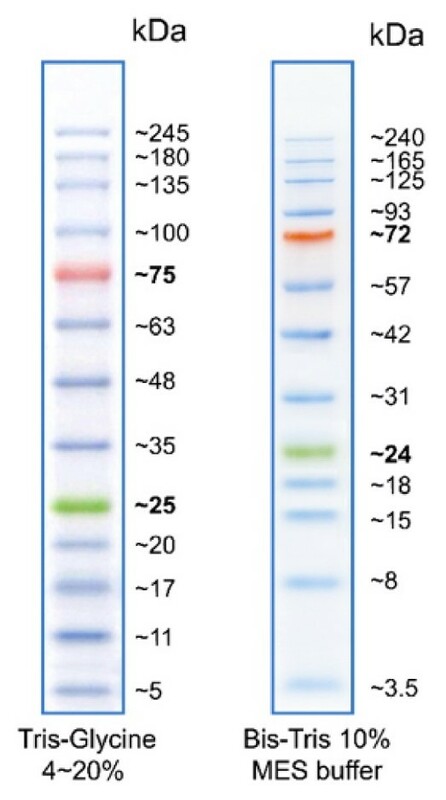 The BLUEstain™ Protein ladder is a three-color protein standard with 12 prestained proteins covering a wide range molecular weights from ~11 to 245 kDa. Proteins are covalently coupled with a bluechromophore except for two reference bands (one green and one red band at 25 kDa and 75 kDa respectively) when separated on SDS-PAGE (Tris-glycine buffer). The BLUEstain™ Protein ladder, is designed for monitoring protein separation during SDS-polyacrylamide gel electrophoresis, verification of Western transfer efficiency on membranes (PVDF, nylon, or nitrocellulose) and for approximating the size of proteins. The ladder is supplied in gel loading buffer and is ready to use. Store desiccated at room temperature. 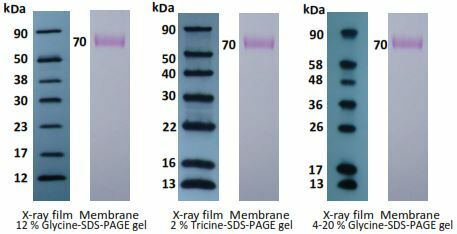 ProGlow™ Western Blot Protein Ladders are designed for Western blots. ProGlow™ ladders can be used to monitor electrophoresis progress and to visualize protein standard bands directly on X-ray film or digital analytical equipment. ProGlow™ ladders consist of eight recombinant proteins in the range of 12-90 kDa. 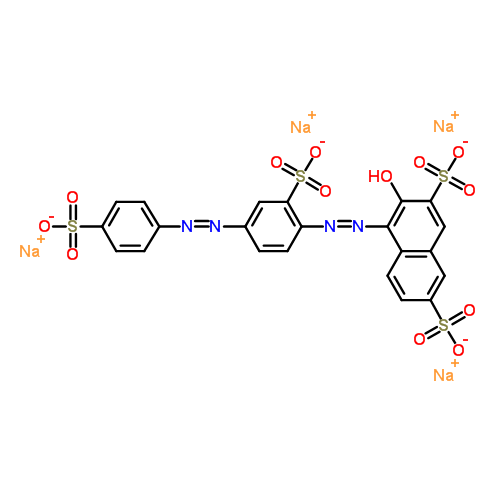 The 70 kDa protein is a prestained marker used for monitor of the electrophoresis process and evaluation of Western transfer efficiency. The other seven markers can bind to human, mouse, rat, goat, sheep and rabbit IgG with their IgG binding site, allowing direct visualization of markers on the X-ray film after ECL development.